Hong Kong can feel like a science fiction movie: From the airport, set adrift from Lantau Island on a strip of man-made land, to the steep condo blocks that sprout like weeds on even steeper hillsides. Rush hour in Mongkok starts at about 4 a.m. Or maybe that’s when it finishes. It’s hard to tell in this Hong Kong neighbourhood, which has the dubious distinction of being the most densely populated place on earth. With 130,000 people for company in one square kilometre, you stop saying “excuse me” after a while. You also learn that outside of Mongkok’s air conditioned malls and hotels, deodorant is a waste of time. So is sleep. There’s far too much to see. Langham Place in Mongkok stands as a bridge between two very different worlds. From the rooftop pool, 42 storeys up, to its spas, bars and restaurants, the hotel exudes opulence. 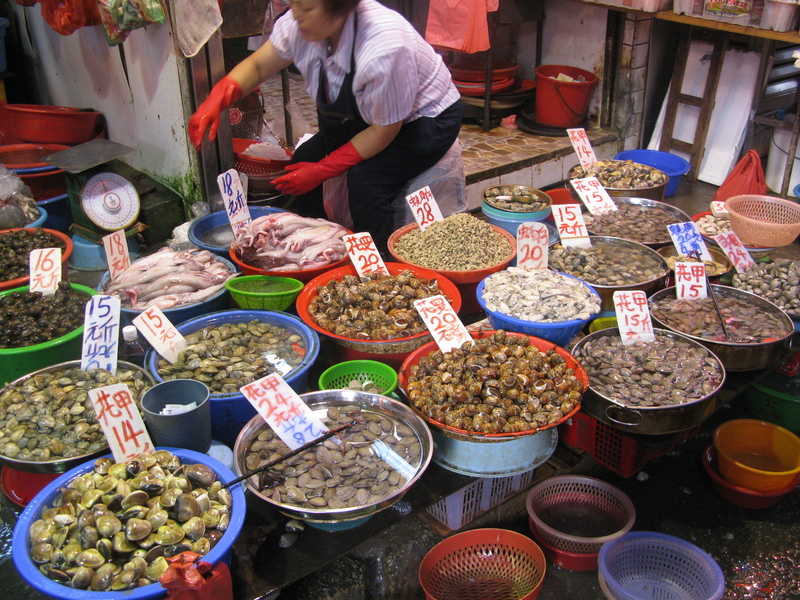 But within a block you’ll find markets selling everything from snakes and frogs, freshly skinned and dismembered, to sea cucumbers and dried pig skin. Such extremes are everywhere in Hong Kong. Mongkok’s street markets cater to a wide variety of tastes, including freshly skinned snakes. From the moment we landed, everything about the place felt like a science fiction movie: From the airport, set adrift from Lantau Island on a strip of man-made land, to the steep condo blocks that sprout like weeds on even steeper hillsides. 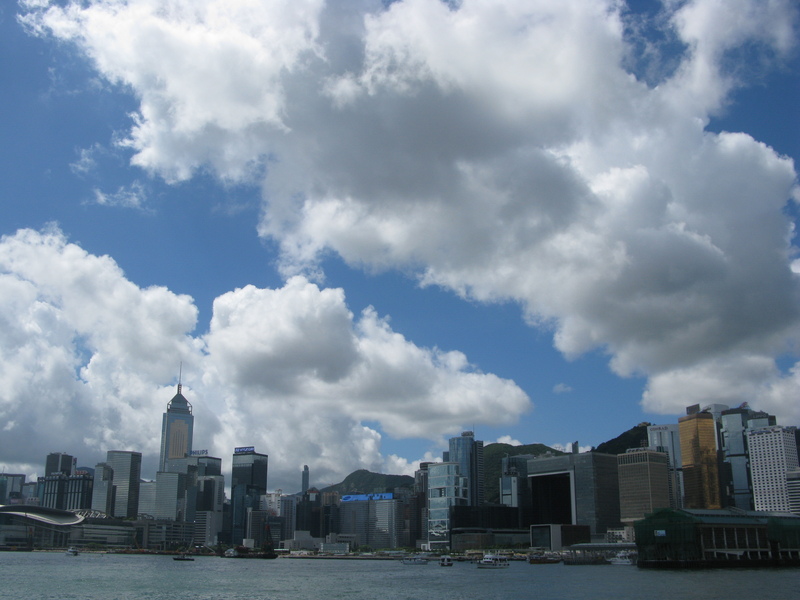 Before Mongkok, we stayed two nights in Central on Hong Kong Island, which faces Kowloon from across Victoria Harbour. As our cab driver raced from the airport through a blur of neon and thundershowers, 13 hours aboard Cathay Pacific suddenly didn’t seem so gruelling. Especially when we arrived at 38 Elgin Street, a third-storey condo we’d booked through airbnb.com. (See sidebar.) After driving on such modern highways and tree lined city boulevards, Elgin Street was a shock. Steep and winding, it barely fit one-way traffic between sidewalks buzzing with bars, restaurants and late-night shoppers. Within 50 yards we could choose from Thai, Japanese, Moroccan, and Italian, yet we fought off fatigue at The Globe, a pub with as extensive a beer list as I’ve ever seen. With a pint of Old Speckled Hen, a scotch egg and tandoori chicken skewers, midnight came and went. Aided by jet lag and adrenaline, we were up six hours later on Hollywood Road, eating breakfast at the Tsui Wah 24-hour restaurant. Fried beef in noodles with scrambled eggs and buttered bun set us back about $2 each and set us up for a morning of walking through cobbled streets as chaotic as the numerous signs competing for space above us. 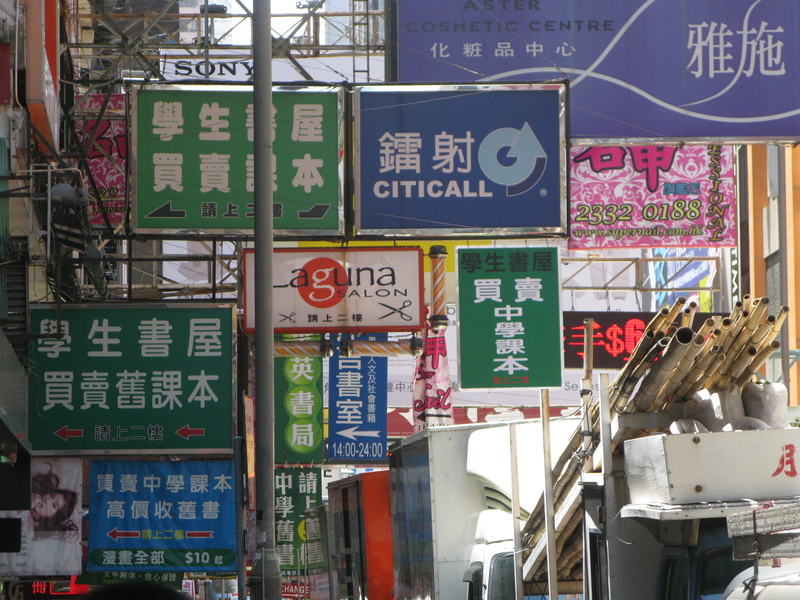 It’s not just people jostling for space in Hong Kong: signs are everywhere! With 150 square feet to call home, the average Hong Kong resident clearly prefers to live life outside. On first impressions, shopping, socializing and worshipping all seem to shape those lives. 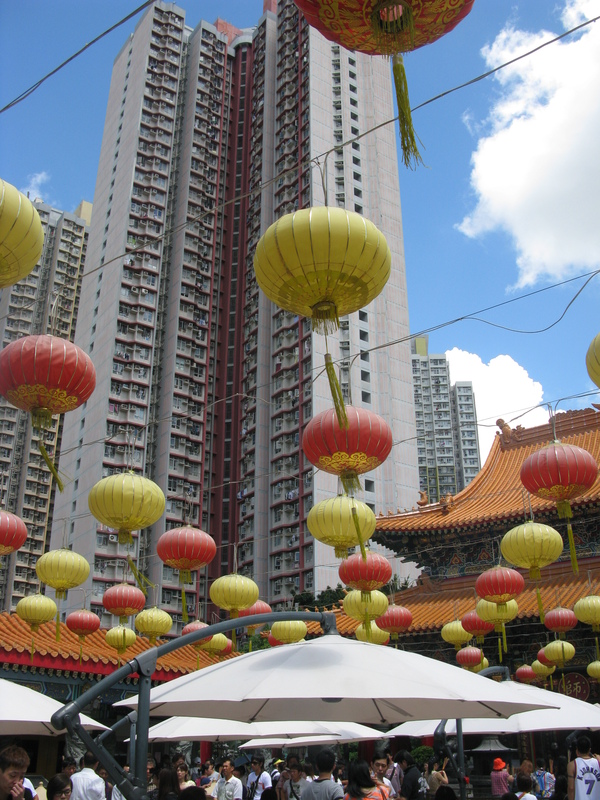 At the Wong Tai Sin Temple, we found respite from Hong Kong’s hustle. Dwarfed by high-rise apartments to the south and hills to the north, the temple’s pools and waterfalls consoled us in the 35-degree heat and 100 per cent humidity. Followers of Taoism, Buddhism and Confucianism worship at the temple where they pray for spiritual answers beneath hundreds of hanging lanterns in a haze of incense. Dwarfed by high-rise apartments to the south and hills to the north, Wong Tai Sin Temple’s pools and waterfalls consoled us in the 35-degree heat and 100 % humidity. One temple for three different religions and open to all sums up tolerance in Hong Kong. During five sweltering, crowded days and nights in Hong Kong, I did not witness even a hint of anti-social behavior – even during an afternoon at Hong Kong Disneyland! And this is an exceptionally easy place to get around quickly. On Hong Kong’s MTR (Mass Transit Railway System), we didn’t wait longer than two minutes for a train and above ground, less than five minutes for a bus. Star Ferries across Victoria Harbour operate about every 10 minutes and are a cheap way to see Hong Kong’s skylines up close. To see those skylines from above, we rode the 124-year-old funicular Peak Tram to the top of Victoria Peak – at 552 meters, the highest point of Hong Kong Island. It’s the best place to definitively gauge your bearings of Hong Kong and witness the magnitude of its growth. Forty years ago, few buildings here rose more than six storeys. Today, legions of skyscrapers bounded by ocean, islands, and forested hills stretch to the horizon. If you can’t catch a breeze atop Victoria Peak, you should get one on the 30-minute ferry ride to Lamma Island. With quiet walking trails, sandy beaches and a coal-fired power station, Lamma is a surreal escape from the city. Within sight of the power station’s towers, we swam at Hung Shing Ye, a beach with life guards, changing rooms and cabbages floating in the ocean. A thunderstorm chased us from the waves and we took cover at the Bookworm Café in the village of Yung Shue Wan – one of two ferry stops on Lamma. The Bookworm epitomizes the village’s bohemian vibe, with good vegan food and indifferent service. There’s a surreal air about the Ngong Ping 360 experience on Lantau Island, too. From the MTR’s Tung Chung Station, Ngong Ping’s cable cars ferried us 5.7 kilometres over Tung Chung Bay, past Hong Kong International Airport and high above the Lantau North Country Park – all with a glass bottom to look through. 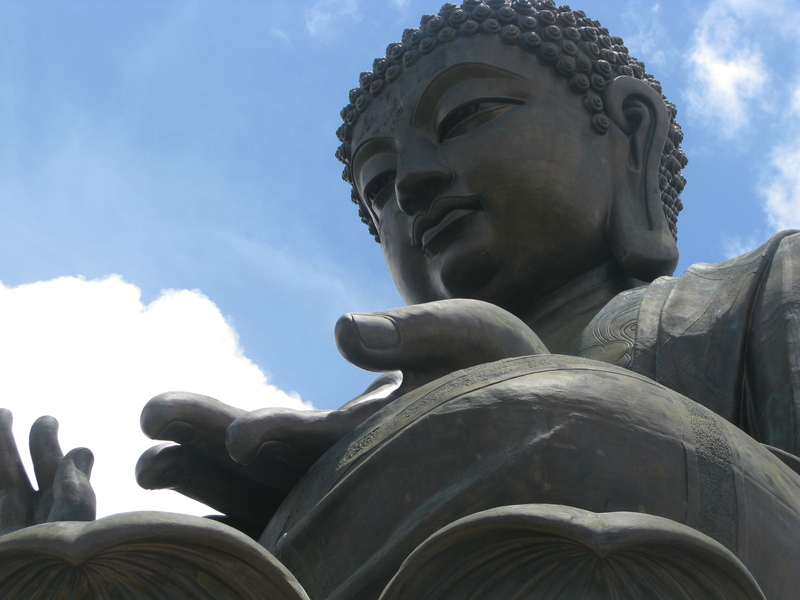 The 25-minute cable car ride alone is worth the price of admission, but so too is what awaits at Ngong Ping village, the Tian Tan Buddha, otherwise known as the Big Buddha. Despite being a popular tourist attraction, it’s possible to find a little serenity at the 34-metre bronze statue, or on any of the 240 steps to its base. And it’s not all tourists here. I watched an elderly lady stop and pray on every single step. Ngong Ping’s ‘Chinese-themed’ village, complete with fast food and souvenir stores, were of little distraction. All the consumerism we could handle was back in Mongkok. By mornings we’d shop the markets close to the Langham for fresh oranges, bananas, persimmons, mango, pears, lychees and cherries. By night, we immersed ourselves in Mongkok’s night markets. Nothing quite prepares you for the human tide that flows back and forth down Mongkok’s streets full of merchandise and vendors waiting to haggle: unless you’re a teenager with cash burning a hole in your pocket. While my wife and daughter disappeared into Tung Choi Street (aka Ladies Street for its clothing and cosmetics), I watched my 15-year-old son Ryan buy soccer cleats and a Liverpool jersey on Fa Yuen Street (aka Sneakers Street, where you’ll find all sporting goods), Dre Beats headphones and iPod case on Sai Yeung Choi Street (an electronics mecca) and two watches on Temple Street (men’s fashions). “You should buy something,” Ryan told me. He was right. About 50 cents later I was eating fried squid and spicy fish balls from a food stand. And I didn’t haggle. 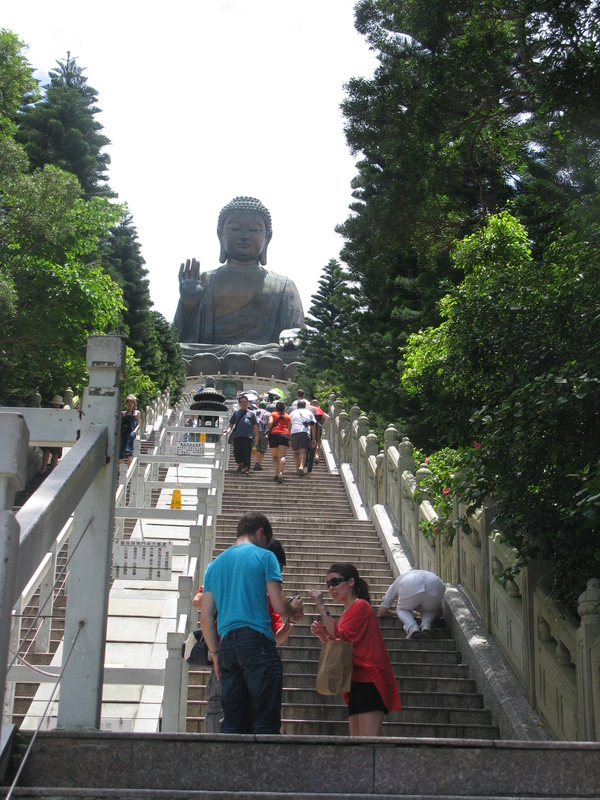 Serenity now with the Big Buddha in Ngong Ping village. Langham Place (http://hongkong.langhamplacehotels.com/) might be the only hotel with a pillow menu, (scents include rose and lavender) such is its attention to whims and wishes. It also offers free guided walking tours to acquaint guests with nearby markets, culture and history. Airbnb.com is an online marketplace for people to list and book unique accommodations worldwide. We followed instructions to text a housekeeper upon landing, and she was there to let us in to our home away from home. It came with everything we needed, including the use of a computer and several of the owner’s local restaurant reviews. 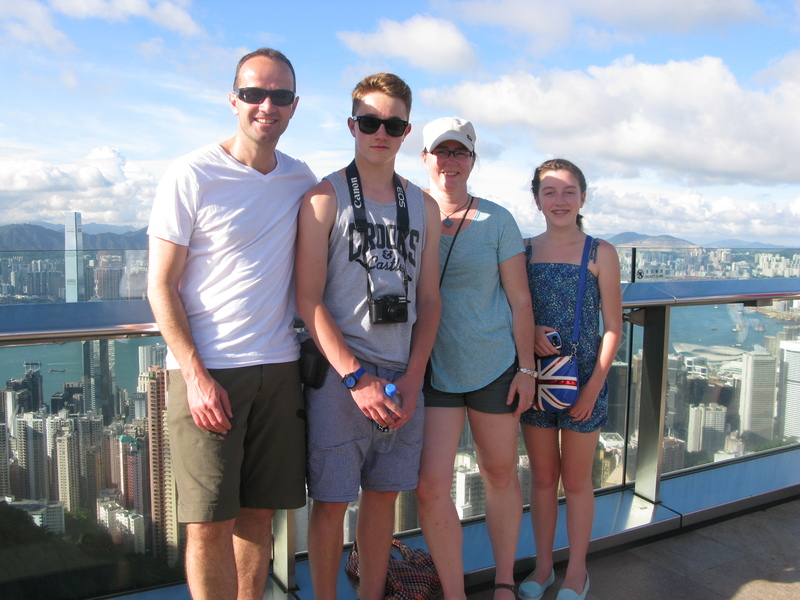 No one in the history of Hong Kong tourism ever thought to take the same photo atop Victoria Peak – seriously!